I have a confession to make. Until yesterday, I had never seen Mamma Mia: The Musical. Really never seen: neither the stage production nor the ubiquitous movie version. Oh, I had heard the music and I roughly knew the plot from the cast album. But seeing the the story on stage — that’s a different story. 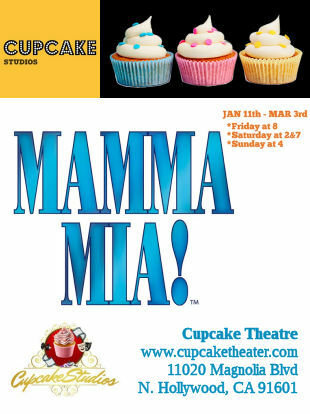 So when a local theatre — Cupcake Studios (FB) — publicized that they were doing Mamma Mia, I thought, “What the hell? It’s time to break down and see the show, plus I’ve heard good things about Cupcake Studios and so I should see what they are like.” So I went on over to Goldstar, picked up a ticket, and made plans to see the show. My experience at the theatre was a bit different than most — and I’ll choose the ticket a bit differently the next time — but more on that after the main writeup. What about the show? As I indicated above, I didn’t know much about the show going in. I knew that it was a jukebox musical built around the music of the group Abba (a group that became popular as I was doing my undergraduate degree). I knew the plot line was: girl about to get married invites her three possible dads to the wedding to figure out which one he is. I knew it was a “chick flick” on stage. That was about it. As the show started, I began to think of it as being the Mortified Podcast, as a musical. For those unfamiliar with Mortified, it features real people reading from their journals, mining their fortunes and misfortunes for humor. In the broad sense, that’s what Mamma Mia is: No deep story or point to be made. A daughter reads her mom’s journal, and brings her embarrassing past to the present. But in the end it all works out, somehow, after some uncomfortable incidents. The basics of the story (which was written by Catherine Johnson, and originally conceived by Judy Cramer) are as follows: A young woman, Sophie, lives on a Greek island with her mom, Donna, who runs a taverna. Sophie (20) is about to get married to a fellow, Sky. There’s one problem: She doesn’t know who her dad is. She finds her mom’s diary, and discovers three men who slept with her mom around the time she would have been conceived, and invites them to her wedding, unbeknownst to her mom. Also coming to the wedding are two of her mom’s best friends: Tanya and Rosie, who used to be in a singing group with her (mom): Donna and the Dynamos. As they then say, hijinks follow as the mom discovers the potential dads — Sam, Bill, and Harry; all three men come to believe they are the dad and offer to walk Sophie down the aisle; and past history is uncovered and revisited. All of this is built and engineered to fit in the music of Abba (music and lyrics by Benny Andersson and Björn Ulvaeus, with additional songs by Stig Anderson, and additional material and arrangements by Martin Koch), meaning that some scenes are specifically contrived to make a song fit in, and ultimately do nothing to advance the plot or grow the character. That’s the nature of a jukebox musical: like the FDAs did with the studies regarding low-fat food (OK, I just discovered Adam Ruins Everything), the story is shaped to fit the music, as opposed to the proper approach of making the music serve the story. In any case, going back to the uncomfortable incidents: Uncomfortable is a good word for this, for there are points where the storyline veers into the uncomfortable. Think about the scene around “Gimme Gimme Gimme” (at least I think that’s the scene) where Sophie and her friends are dancing with (and seemingly seducing) the dads. He’s old enough to be your father — literally. Here we have a bunch of 20-something girls seducing 45+ men. A bit off to me. Similarly, there’s a scene in Act II — built to make a specific song work — about a 20-something guy chasing a 45+ woman. I’m not saying there’s anything wrong with older men or women — I’m an older man, myself — but within the story it created this strange vibe. But perhaps that was just my perceptions — I’m not sure anyone else picked up on it. But other than that, the story was slight. This is not a deep show. It is a romantic comedy on stage; a true “chick flick” romance. The audience ate it up: the loved the music, they loved the dance, they loved the romance. They loved the happy ending, and the sheer joy that Abba’s music brings to the stage (their music has always been a sheer delight). As my wife noted, in the end the story here doesn’t matter much. Does it ever in a jukebox musical? You’re just going to have a good time. Don’t overthink it; go with the flow and have fun. There are a bunch of talented actors on stage, with wonderful voices. There’s great dancing. There’s music you know and love. Everyone ends up happy. What more can you want? This brings me to one of the things I really liked about Cupcake Studios: the execution. Under the direction of producer / director Michael Pettenato (FB), this was a cast that was having fun with the show (which is always a good thing as that fun broadcasts to the audience), gave great performances, and brought life and joy to the material even with the limited budget, space, and facilities. I had been hearing good things about Cupcake productions, and this confirmed the most important thing about any theatre: high quality performance. Before I go into the performances themselves, note the Cupcake double-casts certain roles. This isn’t a problem in-and-of-itself, but they don’t indicate at any given performance who is playing which role (or they don’t indicate that an actor is an understudy in the program). That is a problem. I’ve attempted to guess based on the pictures in the program, but if I made a mistake, excuse me. In the lead positions (at our performance) were Paige Stewart (FB) as Sophie and Erin Eichberg (FB, IG) as Donna. I was particularly taken with Stewart’s performance. Not only was she a strong singer (with a great rock voice that came out at times), but she had strong movement, and particularly strong acting. I just loved watching her face when she was in the background of scenes — she brought a lot of character to her role. Eichberg was also strong, but in a more casual way. Again, strong voice, strong movement, and great playfulness. Renee Wylder (FB, TW, IG) alternates as Sophie, and Laura Hartley (FB) is the u/s for Donna. Playing the potential dads were Brayden Haden (★FB, FB, IG, TW) as Harry, Luis Marquez (FB, IG) as Sam, and Ben Perez (FB) as Bill. All three brought a strong personality to their roles. They were also exceptionally strong singers — in particular, Marquez in “Knowing Me, Knowing You” and Perez in “Take a Chance on Me”, and Haden in “Our Last Summer”. Both of the actresses playing Donna’s friends were spectacular: Deanna Anthony (★FB, FB, IG) as Tanya and Stephanie Lesh-Farrell (FB, IG) as Rosie. They were great in their numbers with Donna, especially numbers like “Chiquitita”. But where they really shone was in the second act: Anthony on “Does Your Mother Know” and Lesh-Farrell on “Take a Chance on Me”. In those numbers they were able to combine strong singing and vocals with wonderfully comic performances. Alternating in the roles are Pamela Welky Paul (FB) as Tanya and Lisa Dyson (FB) as Rosie. Turning to the folks surrounding the bride-to-be Sophie: Mickey Layson (FB, IG) as Sky, Jackee Frome (★FB, FB, TW) as Ali, Lexi Eiserman (★FB, FB, IG) as Lisa. Melvin Biteng (FB) as Eddie, and Christopher Jewell Valentin (★FB, FB) as Pepper. A few performances here are worth highlighting. I loved – loved – loved Frome’s performance. She brought a spirit, energy, and joy to the role that just shone to the back row, and that joy was infectious. Layson brought a nice personality and some good comic moves to what is a smaller role. Alternating as Sky was Matt Karic (FB, IG). Rounding out the ensemble were Nikk Alcaraz (FB), Brianne Campbell (FB), Savannah Ludwig (★FB, FB, IG), Asia Ring (FB), and Steven Duncan Sass (FB, IG). The standout here was Campbell: for whatever reason, she caught my eye when she was on stage. Sass was also Dance Captain and Eddie/Pepper u/s. Music was provided by an (above) stage band consisting of Lauralie Pow Ghahremani as Music Director and presumably on the keyboard, Soichiro Tanabe on Drums, Ethan Chiampas on Bass, and Alec De Kervor (FB) on Guitar. Choreography and movement was by Tor Campbell, assisted by Jackee Frome (★FB, FB, TW). In general, the dance made good use of the space, and seemed reasonably period. Turning to the remaining production and creative credits: The set design was by Rich Kirchhoff III (FB), who developed a basic taverna set that worked well given the limited space in the black box. This set was complimented by the costumes of Page Ridgeway (FB) which mostly worked — I was unsure about whether some of the 1990s looks were correct, and I know the disco outfits needed much higher heels. But budgets are budgets, and with the budget they had, they did a very good job. James G. Smith III (FB)’s lighting design was good — there has been such a revolution in the theatre with the introduction of LED mover lights — no more having to deal with the heat of the Lekos, or the number and power required. The execution of Huck Walton (FB)’s sound design was a bit more problematic: from significant feedback problems to a tendancy to have the sound appear to be more from the speakers than from the actors. This could be a space issue, but hopefully it is something correctable. Rounding out the production team were: Reyhan Rivera (FB) [Asst. Director]; Jackee Frome (★FB, FB, TW) [Stage Manager]; Steven Duncan Sass (FB, IG) [Asst. Stage Manager]; ThurZday Lyons (FB) [Production Coordinator]; Michael Ojugo (FB) [Asst. Stage Manager]. This was our first time at Cupcake Studios. For regular theatregoers like us, they are a bit unconventional. Think Southwest Airlines :-). When you check in at Will Call, you get a Southwest style boarding pass, indicating your seating group: VIP, Early Seating, General Admission, and Special General Admission. Your pass has a number based on the time you check in — this is a theatre where it is important to get there early. They call boarding group (yes, I’m not kidding about this, but they don’t call them “boarding groups”) in that order, in groups of 15. It is very much airport-like. You then go in and pick your seat (except for the VIPs, who have marked seats). We made the mistake of getting Special General Admission, thinking it was like normal comp tickets on Goldstar, and that got us in one of the last boarding groups. I’ll know for next time, but my pain can be your gain. They also made people empty the theatre seating space for intermission while they reset the stage, which I haven’t had happen before. On the plus side, they have good restroom space :-). Their space also has some structural poles that can block views, so be careful as you sit. One other observation on Cupcake — a really good one. In additional to having really strong talent on stage, there were an extraordinary number of children in the audience. Reasonably well behaved children. Children that are getting a taste of musical theatre. Children that are learning the joy of live performance. This is a really really good thing. So, the real question: Will we go back to Cupcake, given the odd loading procedure? I think so, as long as they are doing shows we are interested in seeing and haven’t been done to death. They are getting great local talent, and seem to be executing their shows well. Now that we know how they load the theatre, we’ll plan accordingly. We’ll be back, and they are a great addition to the NoHo Arts Scene. One last note: The name. It turns out that Cupcake Studios was started by Michael Pettenato (FB), who at one time was on the series Cupcake Wars, and ran Cloud 9 Cupcakes in Atlanta GA. After getting out of the cupcake biz, he moved to Hollywood and pursued his love of theatre, starting a cupcake-sized theatre on Hollywood Blvd, which then moved to the larger space in North Hollywood. Hence, the name. No, there weren’t any cupcakes that I noticed on the concession stand :-). Ah, a new theatrical year — one that is starting to fill out. Tonight brings a Nefesh Mountain concert at Temple Judea. February starts with the Cantor’s Concert at Temple Ahavat Shalom (FB), and Hello Dolly at the Hollywood Pantages (FB). The second weekend of February is also busy, with 1776 at the Saroya [nee the Valley Performing Arts Center (VPAC)] (FB) and then running over to Hollywood for Anna Karenena at Actors Co-op (FB). Presidents Day weekend is open, but I’m exploring The Joy Wheel at Ruskin Group Theatre (FB) in Santa Monica. The last weekend of February is our annual trek to the Anaheim Hills for Lizzie at the Chance Theatre (FB). March starts with Matthew Bourne’s Cinderella at the Ahmanson Theatre (FB, followed by the annual MRJ Regional Man of the Year dinner at Temple Beth Hillel. The next weekend brings “Disney’s Silly Symphony” at the Saroya [nee the Valley Performing Arts Center (VPAC)] (FB). The third weekend of March brings Cats at the Hollywood Pantages (FB). The following weekend is Matilda at 5 Star Theatricals (FB). March concludes with us back at the Hollywood Pantages (FB) for Charlie and the Chocolate Factory. What is the threat? If the concern is true outside terrorists (as opposed to the homegrown ones who have been doing the mass shootings), they haven’t been sneaking through the unfenced areas of the Southern border. They have been coming through the airports, coming through normal border checkpoints, and overstaying visas. They are best addressed not through a wall, but through increased CBP mechanisms and personnel, technological observations, enforcement of visas. A wall does nothing to reduce this risk. If the concern is “bad hombres” — i.e., gang members — again, there is no evidence that they are sneaking through the unfenced portions of the border. There is also scant evidence that the threat is there. Yes, there have been a single handful of police officers shot by undocumented immigrants. But what is the overall threat to the population at large? That’s negligible. We must deal with acceptable risk, not complete risk avoidance — and there is a level of risk in law enforcement. We are not seeing crimes throughout the country by this particular group, nor is the percentage of crimes by this group demonstrably rising. In short, there is no evidence that a physical wall would provide any reduction in anything related to “bad hombres”. It is fear and uncertainty, animated by racial hatred and a particular segment of the media who are using the issue to divide when there is no significant risk. If the concern is the immigrant caravans on the border: they are not at unfenced areas of the border, nor is there any evidence that they are attempting to cross at those points. They are refugees, and the best way to address those individuals is to provide more personnel to process their requests fairly and expeditiously. A physical wall is a band-aid on a wound: it addresses the symptom of the problem, not why the problem is happening in the first place. Although the red world is loath to consider spending money outside the US, the funds proposed for a wall would be better spent making the home nations of the immigrants better places. If conditions are better at home, there is no need to come to America for opportunity. Further, the cost of making those countries a better place is much less than building a physical wall, and has much less environmental impact or impact on the lands and properties of Americans living at the border. Security must be looked at as a comprehensive picture. While we argue and shut down the government over a physical wall, we have furloughed significant work on improving and strengthening the Cybersecurity of our nation. NIST’s cybersecurity work is on hold. NSF’s cybersecurity research is furloughed. Increasing our cybersecurity is vital to our national security, and sacrificing that to the wall is idiotic. Our enemies have and will use our technology to subvert our systems and use them for their own aims — and they have done so in recent elections. They are perfectly happy to sit in their home countries and do it electronically, while laughing at our debate over a wall on a border they would never cross. The shutdown has also reduced the border security workforce at the airports (TSA) — again, weakening our security infrastructure. Border security is important, and ensuring entry to the US is vetted and legal is significant. However, a physical wall is not the right way to do this, and it provides insignificant risk reduction. Fear has been created over a risk that just isn’t there, and the actual numbers don’t back up the claims. If there must be funding for a wall, let’s start the right way: determine the most impactful 100 miles that need new wall, and fund that now to provide risk reduction in conjunction with other security mechanisms, because the risk reduction of all wall segments is not equal, and not all require immediate funding. Most importantly, don’t let the focus on the wall battle distract from other border security, including securing our electronic borders. P.S. : The answer to securing our electronic borders is NOT to declare a national emergency and shut off all electronic communications. Just imagine the impact of that on American business and commerce!